Iran has marked what is celebrated at home as a landmark achievement to attain self-sufficiency in production of wheat. Iran’s President Hassan Rouhani on Monday participated in a ceremony to celebrate the success of domestic producers to hit a record wheat production level of 11.5 million tons in a year. The last such celebration was held in 2004 when the former president Mohammad Khatami was in office (1997-2005). Iran’s wheat production at the time had reached 10.5 million tons in a year and the country celebrated the first time it had become self-sufficient in production of the crucial agricultural product in 40 years. Agriculture Minister Mahmoud Hojjati, who had also served in Khatami’s cabinet in the same position, said at the ceremony that the volume of wheat that the administration had purchased from farmers had increased by about four times compared to last year. Hojjati added that Iran had the potential to double its wheat production if the required equipment and facilities were provided. 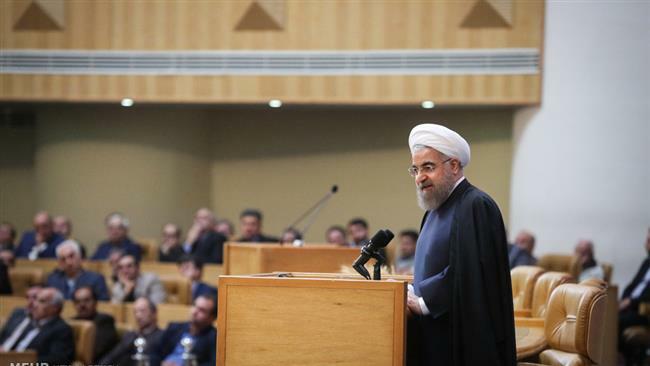 President Rouhani, in his remarks at the ceremony, emphasized that attaining self-sufficiency in production of wheat was a significant success particularly given that the country faced severe shortages of enough supplies when he took office in mid-2013. He said the situation was so dire that the reserves of wheat in some provinces could only support demand for a maximum of two weeks. “We had difficulties for importing wheat and transferring money to pay for the imports [due to the sanctions],” Rouhani told the participants of Iran Wheat Self-Sufficiency Celebration. On a separate front, Abbas Keshavarz, Iran’s deputy minister of agricultural jihad, said that the country had attained around 80 percent self-sufficiency in production of essential agricultural products. Keshavarz told at the same ceremony that Iran’s overall production of essential agricultural products stands at above 110 million tons a year, stressing that the figure marks an increase of 20 percent compared to the last year.